Indiana County Camp Cadet is a week-long summer camp for boys and girls between the ages of twelve to fifteen who reside or attend school in Indiana County, Pennsylvania. Indiana County Camp Cadet is held annually at Camp Seph Mack, BSA in Penn Run, PA, usually during late July or early August. Our program is staffed by Pennsylvania State troopers and other volunteers. The goal of Camp Cadet is to introduce participants to the diverse criminal justice system and to establish a positive relationship with law enforcement personnel. Camp Cadet is open to all youth and is structured similarly to training at the Pennsylvania State Police Academy. All participants who attend Camp Cadet are addressed as “Cadet” during the week. Cadets are required to participate in all scheduled events. Camp Cadet focuses on discipline, self-esteem, physical fitness, teamwork, drug and alcohol education, violence prevention, and many other issues facing today’s youth. Cadets work together throughout the week to complete individual and team-oriented tasks. Each Cadet will have a once-in-a-lifetime experience learning about themselves, various aspects of law enforcement, the role of first responders, self defense, and many other areas. Cadets will spend time playing sports, learning CPR, and creating lasting friendships. For more information, check out the "Camp Cadet" page. Application forms are available for download on this website and at the Pennsylvania State Police Troop A, Indiana Station, 4221 Route 286 Highway West, Indiana, PA 15701. 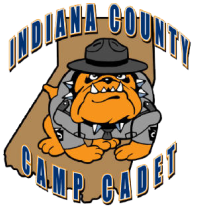 Applications for the 2019 Indiana County Camp Cadet program are due by May 17, 2019. Applications received after this deadline may not be considered. The Camp Cadet program is NOT in any way intended to serve as a "Boot Camp" for your child, and is NOT a solution for discipline problems within your home or school environment. Applicants accepted into the Camp Cadet program MAY BE REMOVED AT ANY TIME if they display repeated, negative behavior considered to be disruptive or contrary to the goals of Camp Cadet.